Many many years ago, my fabulous friend, Jessie, invited me to have dinner with her family. Her mother, Jody, and I seemed to be kindred spirits in many ways, especially when it came to cooking, so it was really nice to be invited to their home. Jodie cooked up a scrumptious German feast and I remember bringing the dessert (a cherry torte that had Kirsch in it, which is a cherry flavored German brandy). 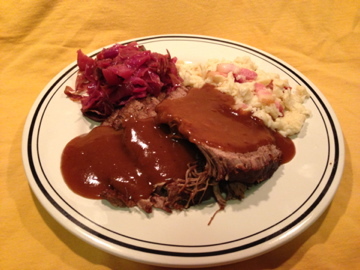 I must confess that I had never tasted sauerbraten until that night, but I was an immediate fan. If you're not familiar with it, it's a German pot roast that is marinated for a really long time in red wine and vinegar and spices. It's so delicious and rich and flavorful! I remember being amazed that she added crushed gingersnaps to thicken the gravy instead of flour because I had never heard of such a thing. Yes, Gingersnaps! Crazy, right? Whodathunk it? But honestly, that's the traditional thing! I think that's now one of my favorite parts of the whole recipe. And the sweetness of the cookies balances with the sour of the vinegar and the spices all work together perfectly. Since then, I've often thought about making it, but never seemed to have my act together far enough in advance. Well, that is, until now! Ever since Chris and Claire have been coming over for Sunday dinner, we've been trying exciting and different cuisines. Chris requested something German for an Oktoberfest sort of a vibe, and so I figured this was the perfect time to FINALLY make sauerbraten! This recipe is my own and it's sort of a combination of many recipes all smushed together. I hope you like it. And thanx again to Jessie and Jody and The Carey Family for the fabulous dinner and fond memories!! Place all marinade ingredients in a small sauce pot and simmer for 10 minutes. Remove from heat and let cool. Place roast in a non metal (glass or ceraminc) bowl. Pour the marinade over the roast. Cover and keep in the fridge for 3 days, turning at least once a day. In heavy, 5-quart dutch oven, over medium heat, cook the bacon to render the fat. Remove bacon. Set aside. Add the beef roast and brown on all sides. Transfer to platter and set aside. Add the onions, carrots, and celery to the pot. Cook over moderate heat until soft and light brown (5-8 minutes). Add meat along with the sugar to the pot. Pour in 2 cups of the reserved marinade and 1/2 cup of water. Cover tightly. Bake in 350 degree oven for 3 hours. Transfer the roast to a platter and cover with foil to keep warm while sauce is made. Strain the solids from the cooking liquid and skim away any fat. You will need at least 2 1/2 cups for the sauce. If additional liquid is needed, add some more of the reserved marinade. Pour the liquid back into the pot and add the gingersnap crumbs. Cook over moderate heat, stirring frequently for approx. 10 minutes, allowing the cookie crumbs to dissolve completely and thicken the sauce to the desired consistency. Depending upon the amount of liquid, you may need to add additional cookie crumbs. Serve with dumplings, boiled potatoes, or spaetzle, and red cabbage. Ok ok, I know what you're gonna say.. 3 DAYS? Yes. That's correct, 3 days! Some recipes even go so far as to marinate it for up to TEN days, but I think 2-3 is just fine. Basically, if you want a more sour sauerbraten, let it marinate longer. Be sure to turn the roast in the marinade several times throughout the marinating process. If the meat is completely submerged, then you don't have to do it as often. If you don't have the right size bowl, you can put the roast and marinade in a large oven bag and then turn it a couple times a day. You can use a sauerbraten spice blend instead of the pickling spice, but frankly, I couldn't find any, and many recipes called for pickling spice, so I went with it. This is traditionally served as a holiday dinner, but why wait until then??? Just came here for some beef ideas and came upon this (which I had forgotten about)! Loving YOU! MWAH!